After four years of exceptional work and dedication, IAIA’s Executive Director Jill Baker is moving on. Delivery of special symposia on topics of critical importance, including sustainable infrastructure, resettlement and livelihood restoration, and biodiversity and ecosystem services. These events are taking IAIA to new regions of the world, places where it has never been: Panama, Manila, Kuching. Holding these events allows IAIA to extend its influence into regions where we could make a difference to impact assessment practices. Facilitation of many small expert roundtables and workshops that provided a forum for IAIA members to interact directly with policy decision-makers in the World Bank and EIB, improving IAIA’s ability to positively influence their future impact assessment policies. Continuing to build IAIA’s network of partnerships around the globe—strengthening existing collaborations with, for example, the World Bank, Inter-American Development Bank (IDB), ERM and Golder, as well as developing new partnerships with organizations such as the International Union for Conservation of Nature (IUCN), and the Asian Development Bank (ADB). Throughout the four years of her tenure as ED, Jill has been a dedicated and motivating leader. Her integrity and commitment to the values underpinning IAIA shone through all of her executive decisions. She worked collaboratively and with a big heart. We will miss her greatly. But, as those of us who know Jill would well expect, she is off to amazing adventures and big opportunities. From August, Jill will join Golder as a Senior Environmental and Social Assessment Specialist. She will be working out of their Ottawa office, and will spend her time working on both domestic and international projects. Jill leaves IAIA in an excellent position. Our Association is thriving and the appointment of the next ED represents an important opportunity for IAIA to continue building on strong foundations. To ensure a smooth transition, continued support for our HQ staff and successful delivery of ongoing activities, including several upcoming IAIA symposia, Board member Susan Joyce will serve as the Acting Executive Director during the recruitment period. The Board is well underway with planning for the global recruitment process, details of which will be released in the next few weeks. So, if you know someone outstanding or perhaps that person is you, please watch this space. 2. IAIA18: Thanks for a great conference! From 16-19 May our host, IAIAsa, welcomed 989 delegates from 83 countries to Durban, South Africa, to discuss “Environmental Justice in Societies in Transition.” Informal feedback onsite was overwhelmingly positive, and preliminary results from the delegate survey indicate that 98% of participants would recommend future IAIA conferences to colleagues. Delegates were emailed an electronic survey, and if you have not completed it already, please take a few minutes before 19 June to provide your feedback; we really appreciate it! If you cannot find your invitation email, contact Bridget (bridget@iaia.org) to resend it. Special thanks to these sponsors who supported IAIA18: Republic of South Africa Department of Environmental Affairs, eThekwini Municipality, IsoMetrix, Canadian Environmental Assessment Agency, PRIZMA, Oil for Development NORAD, European Investment Bank, SEMADET Jalisco, Sichuan Tianyu Petroleum, ERM, The World Bank, Wood, Eskom, African Development Bank, Millennium Challenge Corporation, and South African Airways – the official airline of IAIA18. “Using Impact Assessment to Achieve the SDGs in Asia.” will be held 1-3 October 2018 in Kuching, Malaysia. This symposium will target how voluntary IA tools and techniques, such as sustainability assessments, life cycle assessments, risk assessments, and materiality analysis, can be utilized in a region where regulatory efforts around IAs continue to experience challenges, with both the private and public sector arguing against further investment and business regulation. Two training courses are offered in conjunction with the symposium: "Impact Assessment and Stakeholder Engagement: Effective Approaches and Techniques" and "SIA in Conflict Zones in Southeast Asia: Approaching Sustainability and Understanding Power." Registration will open 26 June. Sponsorship opportunities are available for this symposium. Download the prospectus for more information about how to get involved and the benefits of being an IAIA symposium sponsor. IAIA is organizing high quality training courses in association with its annual conference in 2019. The Board of Directors and the Training and Professional Development Committee (TPDC) are inviting proposals for training courses to be delivered at IAIA19 in Brisbane, Australia, 29 April - 2 May 2019. It is anticipated that training courses will be offered as part of the pre-conference program 27-28 April. Proposals for training courses are due 22 June 2018. See the call for proposals for more information and instructions for preparing a proposal. Proposals for sessions are now being accepted at http://conferences.iaia.org/2019/session-chair/sc19-submit-session.php. Submissions are invited through 16 July. IAIA is grateful to the following organizations who have pledged their financial and in-kind support of this symposium: European Bank for Reconstruction and Development (EBRD); Intergovernmental Forum on Mining, Minerals, Metals and Sustainable Development (IGF); Golder; SLR Consulting; ERM; Centerra Gold; and Lydian International. Do you work with health or environmental assessment? Are you tasked with integrating health and the environment? Whatever your interest in health, the environment and impact assessment, impactshub.com should be on your favorites bar! Impacts Hub provides access to useful case study material, international guidelines, and potential training. It also includes web links to other useful sites. The aim of ImpactsHub.com is to support the community, including impact assessment professionals and others, to get advice and guidance on integrating health and the environment. Impacts Hub has been developed by the Environmental Assessment and Management Research Centre at the University of Liverpool, the WHO and experts from around the world–read more on our blog. 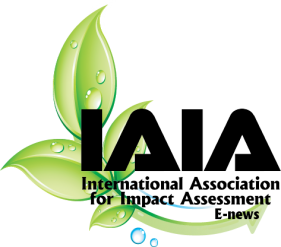 ImpactsHub.com launched at IAIA18 in Durban South Africa. So please check out the site now! The Impacts Hub is a participatory project and there are many ways you can contribute. You can also join the discussion on twitter at #ImpactsHub. Contact us on info@impactshub.com or Samuel.hayes@liverpool.ac.uk. UVP-Gesellschaft e.V. (German Affiliate), is holding a conference on “Fit for the future with environmental assessment - new law and new fields of action,” 26-28 September 2018, in Goslar, Germany. The call for abstracts is open until 15 March. See http://www.uvp.de/de/14-uvp-kongress-2018 for more information. Associação Brasileira de Avaliação de Impacto (ABAI), IAIA’s pilot Affiliate in Brazil, will be holding the Brazilian Congress of Impact Assessment (CBAI), October 22-26 2018. See http://avaliacaodeimpacto.org.br/evento/ for more information. The Committee on Ecology of the House of Representatives, in collaboration with the Philippine Center for Environment, Climate Studies and Sustainable Development (PCECSSD) Inc., is organizing a convention on the Philippine Environmental Impact Statement (EIS) System (EIA@40 National Convention) from 5–7 November 2018 in Manila, Philippines. With the theme of “Delivering Sustainable Solutions,” the convention will advance a multidisciplinary discussion on existing and emerging challenges, as well as opportunities in the field of impact assessment at regional and local levels. It is intended to allow participants to examine the contribution of the Philippine EIS System to sustainable development as well as explore global trends and key developments in Environmental Impact Assessment (EIA). Email eiacon2018@pcecssd.com.ph for more information. The inaugural African Conference for Linear Infrastructure and Ecology (ACLIE) will be held in 10-15 March 2019 in Kruger National Park (South Africa), co-hosted by the Endangered Wildlife Trust and Eskom. Centered around the theme “Building Partnerships: The linear way,” the conference will focus on the intersection of people and linear infrastructure, specifically how both people and nature are connected along, across, and between different types of infrastructure. The ACLIE program includes podium presentations, posters, field trips, and exhibits on topics of special interest to researchers, biologists, engineers, planners, project managers, administrators, and policy makers. See the conference web site for more information.